The site is initially for scholars. 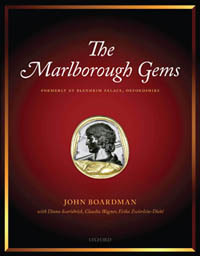 It is dedicated to the Marlborough Collection of gems which has been the object of study at the Beazley Archive for several years, culminating in the publication The Marlborough Gems (OUP 2009), by John Boardman with Diana Scarisbrick, Claudia Wagner and Erika Zwierlein-Diehl. On this website the 2009 publication Marlborough, to be distinguished from the 1899 sale catalogue. The Marlborough 2009 catalogue numbers appear in bold. We are placing here some basic documents relating to the collection, offering an opportunity to view the gems in greater detail and perhaps identify the whereabouts of items still ‘lost’, and other relevant essays and lists, starting with this brief introduction to the collection itself. A full account of each object illustrated here can be found in the publication. The collection of the Fourth Duke of Marlborough (1739-1817) at Blenheim Palace was the largest and most important of the 18th-century English collections, internationally regarded by scholars and connoisseurs as the greatest of the private collections. It comprised about 800 pieces. Of these one third was a Renaissance collection of the Gonzaga Dukes of Mantua (15th/16th-century), acquired by Lord Arundel in the mid-17th century; one third the mid-18th-century collection of Lord Bessborough (including collections of Lord Chesterfield and others); and one third from the Duke's own collecting in Italy and elsewhere. The Gonzaga gems were famed in Renaissance Italy but never published (as were the Medici); the Bessborough gems were a good mix of ancient, Renaissance and later, published in summary lists without illustration; while the Duke's own interests took him over the whole field, from ancient to neo-classical, and he was a notable patron of the most important neo-classical engravers, whose works he acquired. He sponsored a two-volume publication (Delectus) in drawings of 105 pieces. Blenheim Palace. Photograph: John Boardman. Courtesy of Blenheim Palace. The collection of over 800 pieces was finally dispersed at sale in 1899. The present whereabouts of little over one quarter is now known, and has been sought out from Malibu to Monaco, Bari to Japan, many in private collections as well as public. The appearance of less than one third of the whole collection is known from autopsy or mainly 18th-century drawings. The sale catalogue, by Professor Nevil Story-Maskelyne, is very laconic, but there are now other sources. The Beazley Archive in Oxford possesses impressions and electrotype copies of virtually every Marlborough gem as well as Story-Maskelyne's notebooks (acquired by Professor Sir John Beazley), and there are in St Petersburg unpublished 18th-century drawings of many pieces (by Florenz Natter). We have made considerable progress in the reconstruction of the collection and identified impressions of the majority of the collection among the wax impressions and electrotypes in the Beazley Archive. Both, impressions and electrotypes (partially affected by corrosion), have been cleaned and photographed. Many of the gems are in private collections. Even in the major collections the collection history is often not known. A series of photographs of the originals, impressions and electrotype casts of the whole collection, as published, including those not yet located. Any information on the latter will be gratefully received at claudia.wagner@beazley.ox.ac.uk. Additional information about individual gems in the collection, both anecdotal additions to the publication and new information. A lecture by John Boardman on the collection. A facsimile of the Album of photographs of the gems, issued in 1875. A facsimile of the 1782 Northampton summary catalogue of the Arundel collection, at the time when it was pawned by the Earl of Peterborough. A facsimile of the 18th-century copy (made by Smart Lethieullier) of the Latin catalogue of the Arundel collection, the text of which may go back to the time of Lord Arundel. By kind permission of the Society of Antiquaries. The 18th-century catalogue of the Arundel gems compiled by Andrew Fountaine. A facsimile of the 1899 Sale Catalogue of the collection, with annotations. Natter, Catalogue des pierres gravées, tant en relief qu’en creux de Mylord Comte de Bessborough (London 1761), including lists of the Chesterfield and Medina gems in the collection. This is the version of the catalogue in which the Chesterfield and Medina collections are separately listed.